I'll be attending the Open Source Bridge conference later this week here in Portland. I'm very much looking forward to it, partly because I love to use and contribute to open source software, but also because the conference itself has been run in an open source manner -- by volunteers, building open source conference software, and with the overarching goal of trying to answer a question: "What are the rights and responsibilities of an open source citizen?" Before I moved to Portland, and before I was more regularly attending conferences, I had always wanted to attend OSCON, which was held in Portland every summer from 2003 to 2008. Part of this was to visit Portland and to feel the conference vibe in this city. Now that OSCON is moving back to California, and Open Source Bridge is here (as am I), I'm ready to help make this conference an awesome reason to explore open source in Portland. Hope to see you there -- there's still time to register! Quality time with the MacBook Pro 17"
I’ve been wanting to post about my new machine, the MacBook Pro 17" announced at Macworld in January. I haven't seen a lot of talk about the model outside of the perfunctory post-announcement reviews and the occasional rant about closed battery systems, so I wanted to contribute the review that I was hoping to see. After a month or two of waiting, repeatedly calling Apple Stores to check availability, getting down to a store to check it out in person, and finally ordering one through my developer discount, mine arrived on March 25. So I’ve had a bit over a month to really put it through its paces, at least for my day-to-day needs, including plenty of days coding, doing visual work, backpacking it around, taking it on a flight, and working outside on those rare but wonderful sunny Portland days. I’m not going to talk about the assumed: yes, it’s fast, having a lot of RAM is great, the hard drive is huge, et cetera. I’m going to cover the things that aren’t guaranteed with a new Mac. Adjustments that you have to make so that it feels comfortable. New technologies, often not yet seen in the field, and how they work day-to-day. And best of all, pleasant reminders of machines that you used to have, either in features that have made a reappearance or things that behave just like you’d expect but still delight you in myriad tiny ways. I purchased the base model: 2.66GHz Core 2 Duo, 320GB 5400rpm drive, 4GB of RAM, and an added Mini DisplayPort-to-VGA adapter, which I will soon be putting to work in the coming weeks for a couple presentations. In every case, they have always been my sole machine, always running AirPort wireless as the main connection method, always eventually needing a second battery, and always carried around nearly every day to various places while working. This latest machine joins a venerable line of mobile work computers, typically in use 10-12 hours a day, for Cocoa development, web development, systems administration, and all of the assorted daily tasks like web surfing, email, writing, and the like. Of course the feature that everyone is here to read about is the revolutionary, long-life, non-removeable battery. Apple promises "up to eight hours of wireless productivity" and although you always have to take that with a grain of salt, in my humble opinion, it’s true that the future of laptop energy systems has arrived. The new battery is, in a compound word, life-changing. As a solo entrepreneur working without a formal office, part of what keeps me sane is getting out into the neighborhood (and beyond) each and every day, working from coffee shops, tea houses, bars and restaurants, and client offices. I was once a plughound, always scanning the room for the power outlets so that I could set up shop and not have to make a run for it in an hour or two. But plughound no more! It’s no exaggeration to say that I can probably count on one hand the number of times that I have used the plug-in power adapter outside of the house to get some juice. Often times, depending upon the day in question, I can get home and still use the battery to watch some Hulu or start, and sometimes even finish, a movie. But you didn’t come here for the namby-pamby tales of a plughound. You want numbers. And the numbers are good. I easily get 6.5 hours of battery life, and that’s with wifi on and in full use, the screen brightness up all the way (and it goes up high), and my standard 10-15 applications running for development, reading, surfing, writing, and keeping tabs on things. Another nice aspect of this machine is that, unlike my Core Duo MacBook Pro, running on battery doesn’t mean that the CPU power is reduced. While there is an energy setting for the higher-performance graphics setting (which I actually haven’t yet tried), the processor remains the same whether you are running on power or battery. Two other related notes about the battery just for completeness: the "time remaining" countdown is accurate nearly to the second, and when the machine goes to sleep upon battery run-down, it hibernates every time. This means that the sleep light goes off, the machine powers down, and the RAM state (all four gigabytes of it) is saved to disk. This behaves much last my last model, though that one would typically be in sleep mode for an hour or two before powering down completely, even on a new battery. This new model does it every time the battery runs out (which, admittedly, I don’t get to see that often). So: life-changing. If this is what the future has in store, then bring it on. Even when working at home, it's nice to not have to fuss with the power cable just to get some work done. I was one of the people who lamented the loss of comparably-priced matte displays only having spent time at the Apple Store with them. However, if you’ve ever been to an Apple Store, you’ll recall that there are two distinguishing factors about the laptop retail displays there: the machines are at about waist level (for me, anyway) and the stores themselves are brightly colored and incredibly well lit. Seriously, have you ever seen a shadow in an Apple Store? However, I can safely say that after only a day or two of full-time use of the new machine in many non-Apple Store settings, I hardly even noticed the glare. This includes quite a bit of outdoor use (which, by the way, is made much better by this model’s screen brightness) as well as a variety of indoor situations. If you have an iPhone or iPod touch, here’s one more way to look at it: are you ever distracted by the reflection of your finger in the touch screen? I would doubt it. Really, it's not a big deal. I can see it being an issue for certain types of users, but for general use, I don't see a problem. I don’t use a lot of peripherals in my day-to-day work -- typically, just an external drive on occasion for Time Machine backups of my daily work. However, I just had to appreciate all the peripheral space being given to the user in this new model -- three USB ports in a row on the left side of the case. Another change for me with this machine was the discontinuation of FireWire 400 ports. 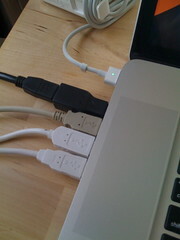 I’ve got a few FireWire devices, namely external hard drives, but most are accessible by USB anyway. As for FireWire 800, I had it on my PowerBook, then it went away on my last MacBook Pro, and now it’s back. Being as it is the only FireWire port, I had to acquire a small adapter for FireWire 400 devices, which I’m happy to report works just fine. The unibody construction marks the first pro-level hardware revision since I’ve been using modern Macs to feature a slot-loading media drive on the side rather than the front. For the most part, it doesn’t affect me much, but occasionally I’ll have a beverage, my iPhone, or my glasses next to the computer and I’ll have to move them to use the drive. There is an improvement, however, when I use my laptop stand, which features a tilted top with a wooden ledge at the bottom so that you can incline the keyboard steeply and not have it slide off. Having the drive on the side makes this much easier, as I don’t have to see or access the front edge of the machine at all when I’m using this stand. A feature that I’m happy to see back since the move from my old PowerBook is a lid that opens much wider than the previous MacBook Pro construction. Frequently I will have the laptop on my, well, lap, or I’ll be using my laptop stand and want to incline the keyboard half of the machine quite a bit. This machine allows for about a 135 degree angle to the lid, which is more than enough for these uses. There’s not much to say about the unibody construction (shared with the current 15" model) that hasn’t already been covered in the industry media, but I’ll mention a few highlights. The case is solid, beautiful, lightweight, and makes me feel like I’m living in the future. Seriously, this machine is lust-worthy and I already own it. One thing I have noted about the construction is that it’s precision engineered to the millimeter. In past Macs, no matter how new, sometimes the lid was a little off, or the gap between the lid and the case was not even on both sides. But this model is engineered like a nuclear reactor. From every angle, everything is pleasing to the eye. Lastly, on both of my previous Macs, after a period of months I experienced the dreaded surface pitting problem at the hand rests. While it’s likely too early to tell on this machine, I’ll be keeping my eye out for the slightest change in the surface finish. So far so good. It goes really loud. Much louder than my previous models. I only crank it up all the way when watching movies from across the room. Loud, loud, loud. In what is perhaps my only niggle with this machine, I do have an issue with the button-less trackpad. While I quickly adapted to not feeling the button there, and I absolutely love the gestures (especially the four-finger Exposé swipes), I had to turn off the secondary click options. On my last Mac, I was used to holding two fingers on the trackpad when clicking for a right-click. But on this machine, I accidentally triggered it way too often, perhaps because I am used to resting the second finger at the front edge of the trackpad, where once there was a button. I also gave the lower-left and lower-right single-click options a try, but found that the tracking areas for both of these clicks strayed too far into my normal clicking area. So, short version: the only way I can right-click is to hold down Control, just like we used to do. It’s a small price to pay. I have to admit that for the first few days, I had a terrible feeling in my stomach that I had made a mistake going up in machine size after many years on 15" machines. I was very aware of the size difference and while it was nice in the screen real estate, whenever I would heft the machine, I’d get a sick reminder of the fact that 17 inches is more than 15 and 6.6 pounds is greater than 5.5. However, after perhaps three or four days, I became totally accustomed. Now, after a bit over a month, looking at my old 15" is like formerly looking at a 13". It seems like a toy, like something you would use on one knee while reading a recipe in the kitchen or quickly showing someone a photo you took. What it really comes down to is one question: are you doing a baton routine with the computer, or are you sitting at a desk and computing? I carry the machine on my back every day while out and about and have no complaints. I’ve been on a couple airplanes and you know what? I usually listen to podcasts or read rather than work on my laptop, and this was the case with the 15" as well. My take on it is if you have a strong need to compute while on an airplane with a large-screen computer, you either also have the means to upgrade to first class so that you have the space, or you should be taking a vacation. Of course the switch from 1440x900 to 1920x1600 was a bit of an adjustment, but I got used it quicker than I got used to most other aspects of the machine. I bumped up the text size in Twitterrific, I now frequently make use of the Readability bookmarklet (which I probably should have been doing sooner anyway), and I bask in the wonderfulness of a ton of palette space, great 2-up document viewing, and photo slideshow heaven. The display is simply stunning. In conclusion, there's not much more to say. If you are considering this machine, I highly recommend it. And if you won't take my word for it, just ask Consumer Reports -- Macs swept every category, and the 17" most of all. You may also be interested in my unboxing photos on Flickr. Particularly enlightening is the comparison between various laptop generations' packaging size. I wanted to get the word out about BarCampPortland this Saturday at CubeSpace here in Portland. BarCamp is an "unconference", an ad-hoc gathering of tech enthusiasts over the course of a day to jam on ideas, implementation, personal networking, and whatever else they want, all unplanned and take-it-as-it-comes. Tonight was the kickoff, which involved some registration (which is free, by the way), some food, some meeting folks, and some proposing of sessions for tomorrow. Inspired by an excellent session at this year's SXSW, plus the fact that I've now been working at my own business for two-and-a-half years, I proposed a session called Solo Shops (and how to stay that way). I hope to facilitate a discussion about how to get going, but more importantly, how to manage a business entirely on your own whilst staying sane, profitable, and engaged. There are a whole host of awesome sessions up on the big board, so I can't wait for the events to begin. Just a quick note -- I'm in Austin, Texas at South By Southwest Interactive (for the fourth time) trying to tap into the current happenings in tech & design culture. If you're here as well, let's try to meet up -- I love to meet new folks. I hope to write more after the conference about both SXSW and Drupalcon from last week, so stay tuned! I'm currently at the biannual Drupal worldwide conference, Drupalcon, in Washington, DC. I hope to write more later about the amazing people and innovative technologies that I'm seeing here this week, but for now I just wanted to post an entry for folks arriving here looking for information about the talk I gave yesterday: Beyond The Web: Drupal Meets The Desktop (And Mobile). I will be posting more information later on the resources & projects mentioned in the talk, but for now, watch this page for that info as I'm able to post it. 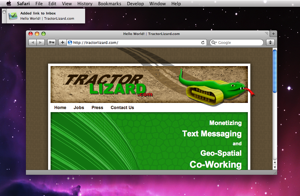 I covered a number of technologies that can connect Drupal websites to desktop and mobile applications, be they in Cocoa (for the Mac & iPhone) or any other language that you might want to integrate with a PHP-based Drupal site. Hope to see you at Drupalcon! 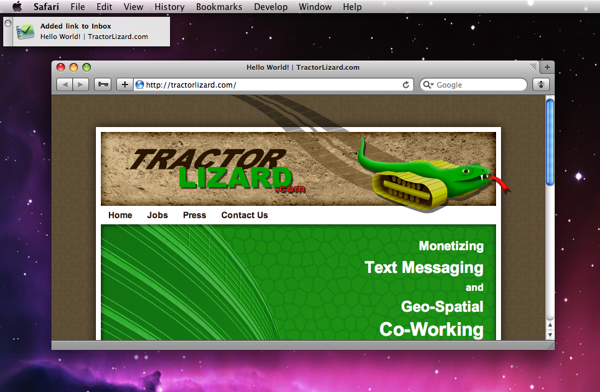 I wanted to take a moment to help promote an upcoming Mac developer conference. 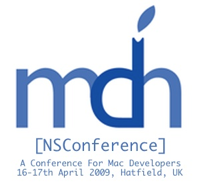 Scotty over at the excellent Mac Developer Network (a podcast network that I've participated in a couple times) is organizing a Mac developer conference in the UK in April that looks simply amazing. The speaker list looks fantastic: Bill Dudney of Pragmatic Programmer iPhone book fame, Matt Gemmell (he of of the custom Cocoa controls), Mike Lee (World's Toughest Programmer), Fraser Speirs of iPhoto & Aperture plugin fame, and several more, plus workshops and what I'm sure will be excellent networking amongst Mac & iPhone developers. Unfortunately, due to a lot of travel and moving in March, I won't be able to make the trip to the UK for the conference, but I'm hoping it becomes a regular thing as I would definitely like to in the future. If you are looking to jump-start your Cocoa development skills, NSConference looks like it would be a great way to do so. Late last week, the excellent social bookmarking service Ma.gnolia suffered a catastrophic system failure. Recovery efforts are still underway, but in the meantime, if you are a Pukka user, you can rest assured that your bookmark data is safe and sound. As of Pukka 1.7, Pukka automatically makes backups of all of your accounts in a format that can be reloaded into Ma.gnolia (or any other social bookmarking service with a similar API, for that matter). To get to your backups, see Pukka's main menu for an item that opens the backup folder. 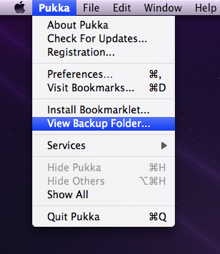 Pukka updates these backups every time it pulls a full copy of your bookmarks from the server, which can happen several times a day, depending upon use. Our thoughts go out to Ma.gnolia as they work to recover their systems.